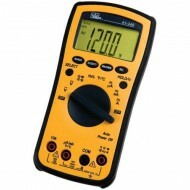 IDEAL Test-Pro Multimeters (340 Series). 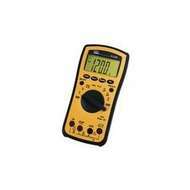 Features: capacitance, frequency, temperature, voltage, current, resistance, audible continuity, relative mode, backlight, min/max and data hold. Includes: Low battery indicator, auto power off and 2-year warranty. Features: AC/DC current. AC/DC voltage. Resistance. Audible continuity. Features: AC/DC current. AC/DC voltage. Resistance. Audible continuity. Features: AC/DC current. AC/DC voltage. Features: AC/DC current. AC/DC voltage.